Just as many other Russian painters of the first half of the 19th century, Anton Mikhailovich Legashov worked in different genres. 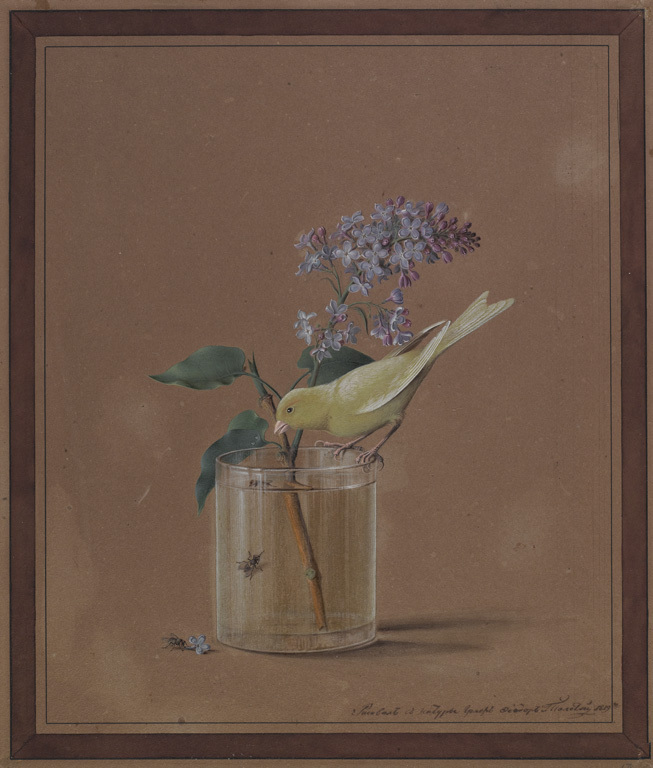 This still life is exhibited for the first time. In this picture the artist creates an unusual setting in which magnificent southern fruit are represented against a landscape of the Central Russian: they are put on the hillside, right on the earth, at the bottom of the rotten birch stubs. 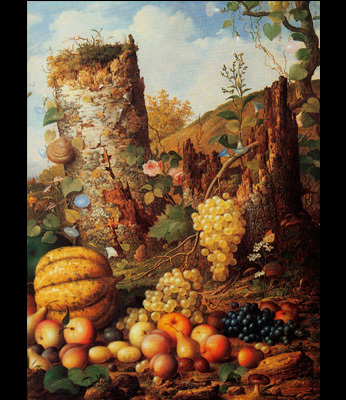 The composition of the picture is also original: as it is usual for the classical still-life, the heap of fruit is shown from the close point of view, but the upper part of the canvas is occupied with the sky giving the depth to the picture. The contrast between the plans and their contents underlines the exotic composition of this still-life. 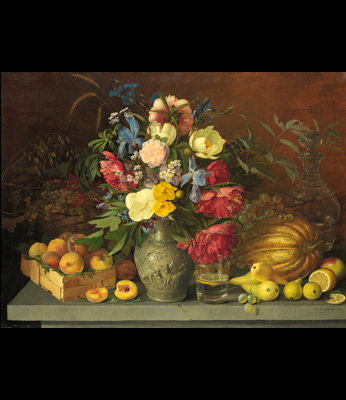 The subject of the picture brings it very close to the exhibited "cabinet" still-lifes of 1730-1740s. 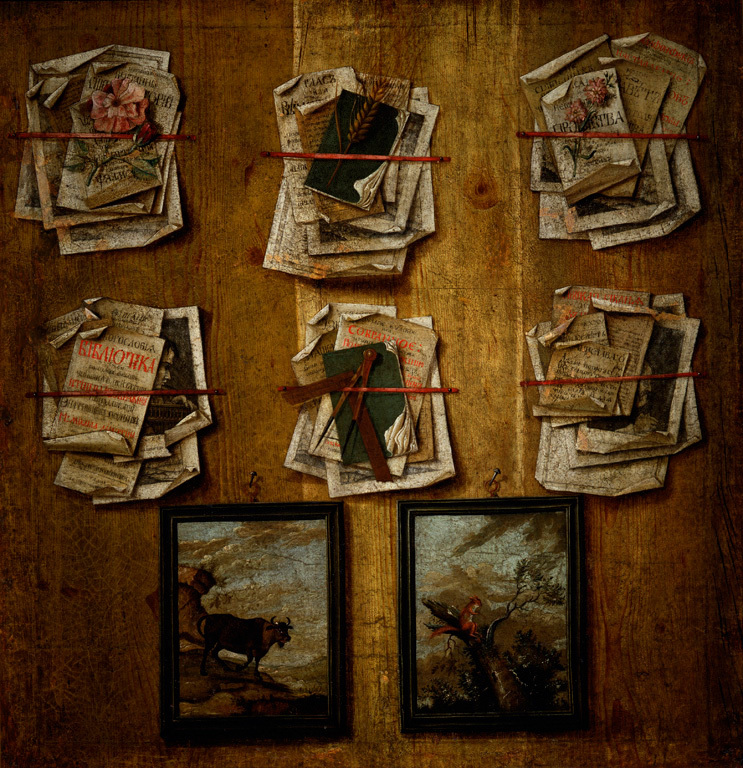 The canvas represents a version of some picturesque trompe l'oeils. With an extraordinary accuracy the artist shows bunches of paper sheets attached with the laces or ribbons to the wooden supports. 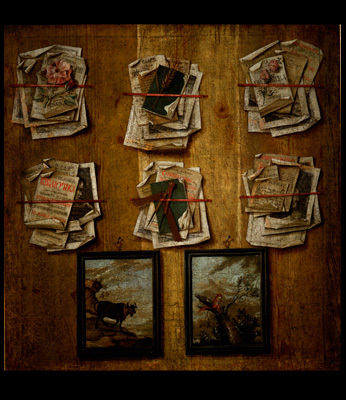 All over the room we can see scraps of letters, separate pages from books, engravings. For the artist those things were signs of the usual life, may be of his own life, but for us they look like parts of fascinating and mysterious history. Mikhail Alexandrovich Roginsky is a representative of the alternative Soviet art of 1960-1990s. He is a theater artist by education, but his true passion is easel painting. According to his words, «it was the reflection of life and its natural continuation». 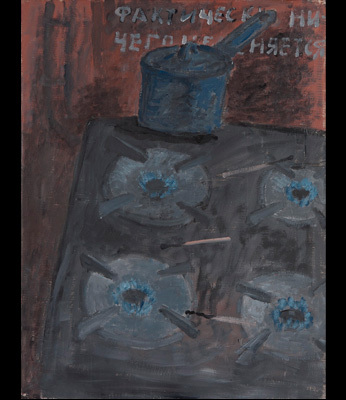 Since 1960s, Roginsky had been creating «portraits of things» one could find in any Soviet kitchen; he went on with this theme later, when being in emigration in France. 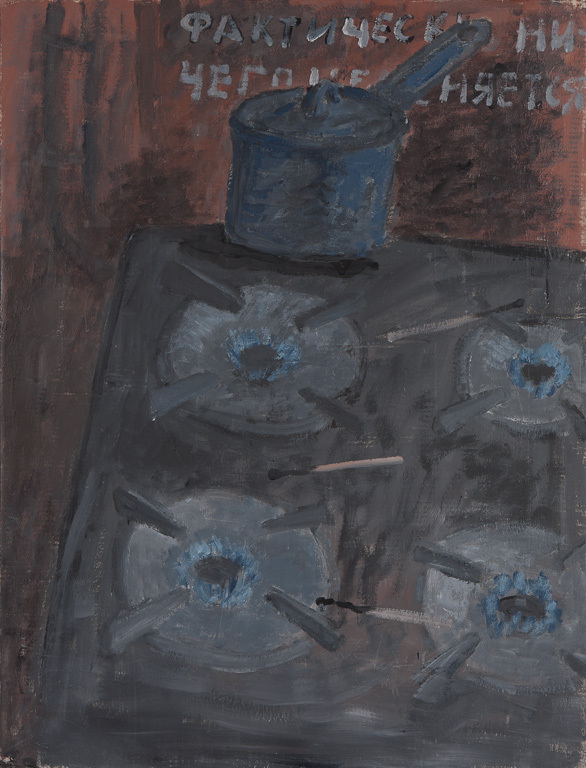 Regular subjects of everyday use, different kitchen stuff, painted from life, become "heroes" of his paintings. They possess their internal dignity, abstracting from the poverty of everyday reality. For Roginsky the real life is the basis for the embodiment of his lofty ideas about the human being existence. Vladimir Dmitrievich Sverchkov was one of a few artists of the second half of the 19th century, who worked in the flower-still-life genre. He was a military man by profession, however, after resignation, he became an auditor-student of the Imperial Academy of Arts and fully devoted himself to painting. From 1856, Sverchkov lived abroad and owned a workshop. This workshop was carrying out orders for decoration of interiors, including orders for art works on glass. 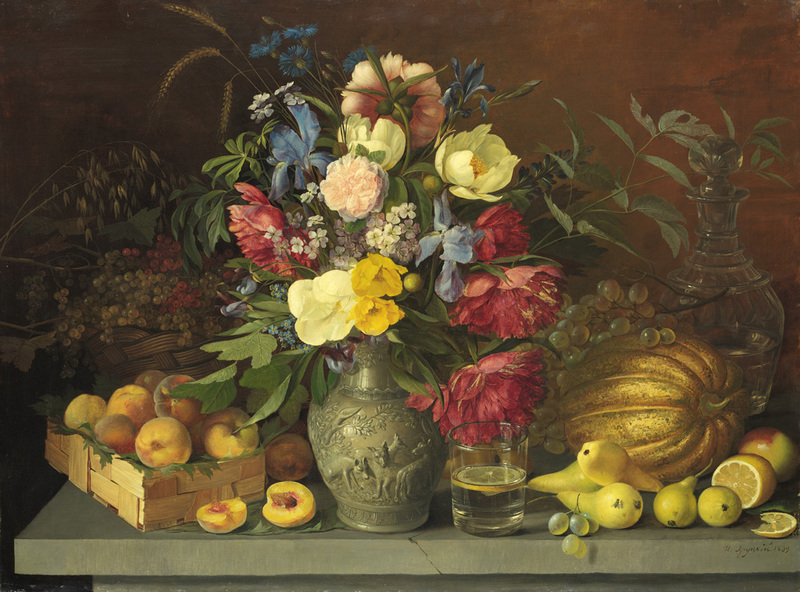 In 1873, the artist moved to Florence, where he continued painting still-lifes mainly with flowers and fruit. The artist preferred festival, colorful flower compositions, giving them solemnity and decorative elegancy. 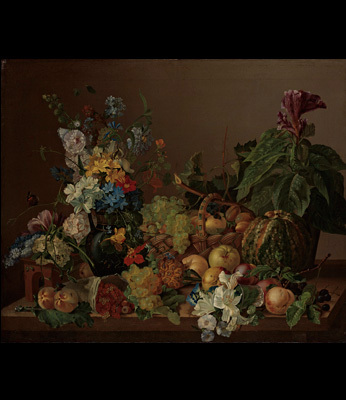 In one of his latest works, «Flowers and fruit», Sverchkov paid special attention to a heavy drapery on which the ripe fruit lie, and to a marble panel which acts as a background for the magnificent bouquet and emphasizes the uncommonness of the represented items. 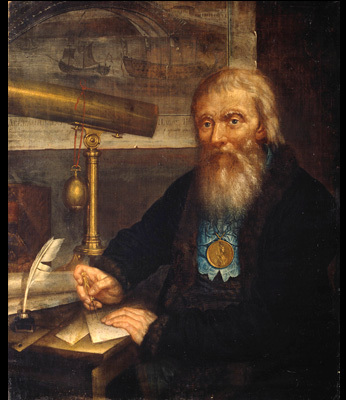 This is a rare portrait of the outstanding Russian self-taught mechanic of the 18th century Ivan Petrovich Kulibin. Born in Nizhniy Novgorod city, he became famous for many inventions. 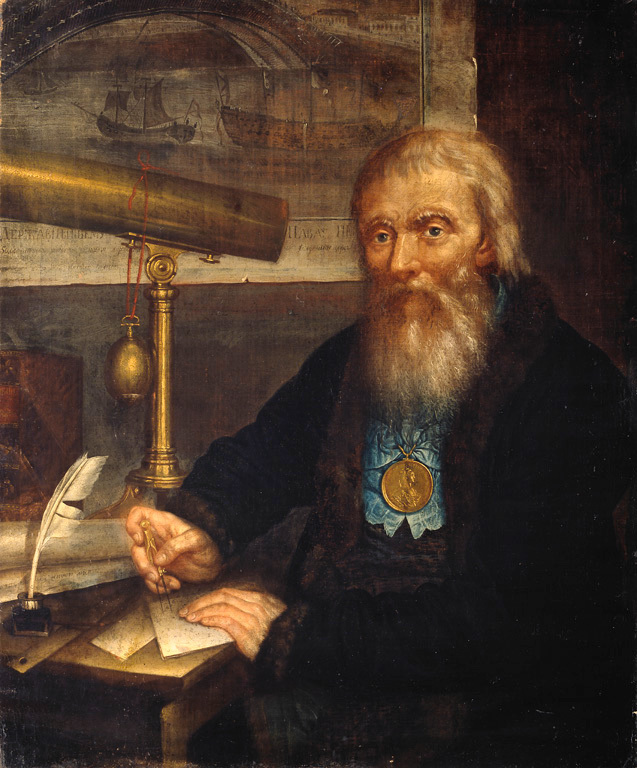 The portrait made by the art teacher and icon painter Petr Afanasievich Vedenetsky looks like a hagiography of the scientist: Kulibin is surrounded by the things, telling about his inventions, his scientific activity and at the same time can be considered symbols of science. The artist specially and a bit naively underlines the materiality of these subjects. On the table there is a telescope, enhanced by Kulibin, and a music clock in the form of the egg, which he presented to the empress Catherine II. On the wall of the office there hang an engraving of another invention of him - a one-span bridge. The wooden model of the bridge was successfully tested in St. Petersburg in 1776. For that project, the empress awarded Kulibin with the St.Andrew's Ribbon and a specially made gold medal. The inventor sits for his portrait, wearing the awards. The subject of this still-life is quite unusual for Russian art of the period. 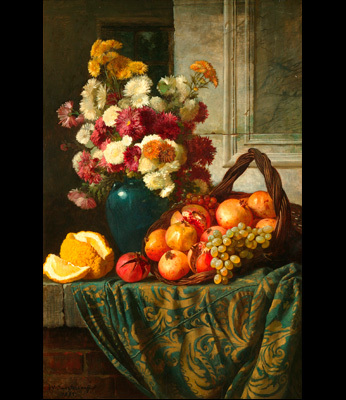 In the first half of the 19th century the members of the Academy of arts preferred to paint flowers and fruit, but this composition could possible be called "lunch" or "snack". Apparently, the artist just took advantage of the subjects at hand. 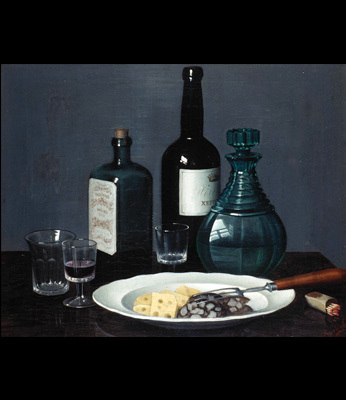 The bottle and a shtoff, a decanter and wine-glasses, a faience plate with the snack make the still-life look not only very specific, but betray its obviously male character. These things were taken from the artist's everyday life, confirming the words of V.F.Odoevsky - a writer of that time: «The best way to know a person is to look at the room where he spends the most part of his life». 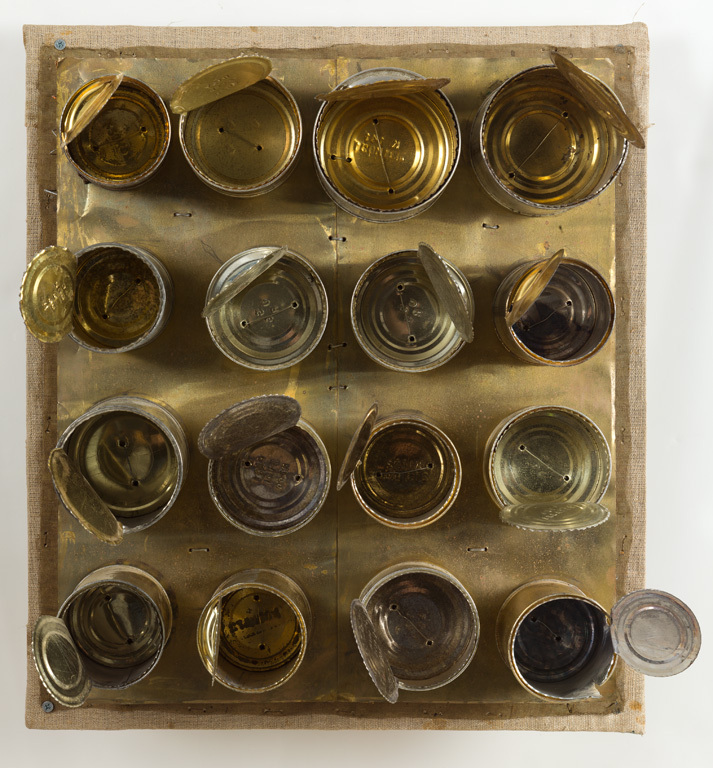 Ilya Iosifovich Kabakov was one of the leading artists of Moscow conceptual school of 1970-1980s. In this collage the artist directly used the technique of the room trompel'oeil of the 18th century, but filled it with a new sense. Post cards, which were mass-printed in 1970s, are glued to a cardboard sheet. 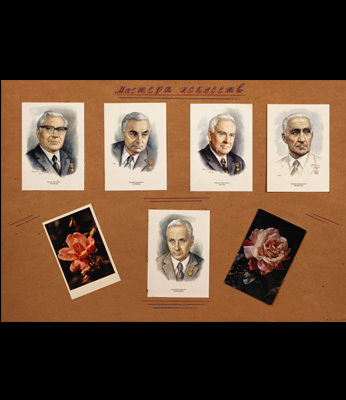 On those post cards Soviet theatre and cinema prominent figures wearing strict suits and official awards look more like Soviet officials. The formal style of the portraits in pencil-drawn frames contradicts with the neighboring flowers and the naive inscription. 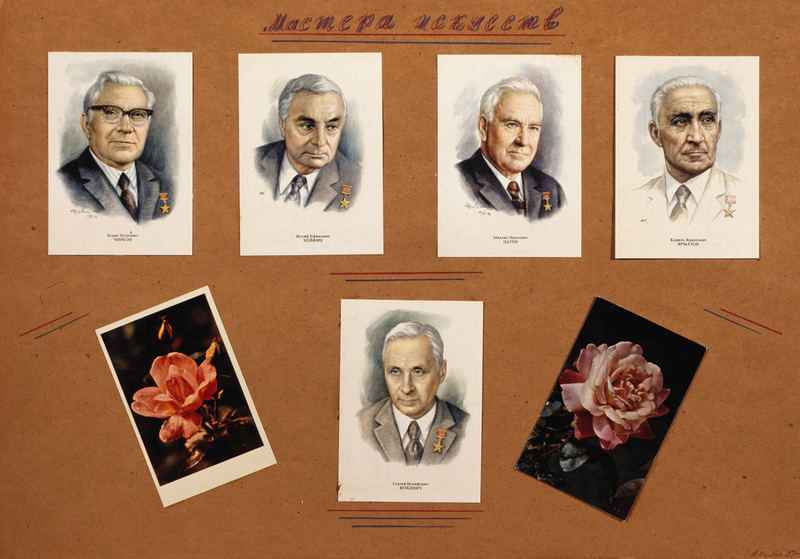 The absurd contrast of the officialism and the deliberately touching homemade product is obvious and is perceived as a rigid author's irony of the false cultural values of the Soviet society. 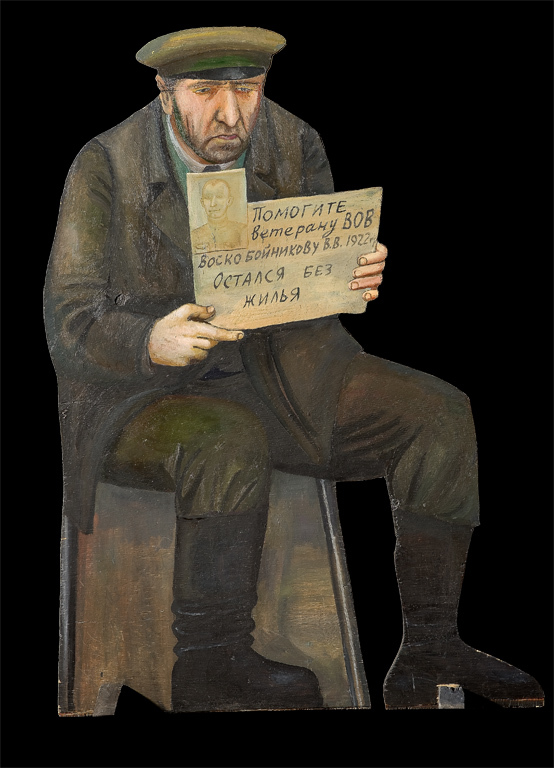 The inscription on this watercolour drawing says, that its author is a «Retired Civil Conductor of the Ministry of Railroads Georgy Kuzmich Leonov». The amateur- artist, whose photograph can also be seen in the drawing, lived in the cities Yaroslavl and Rybinsk. 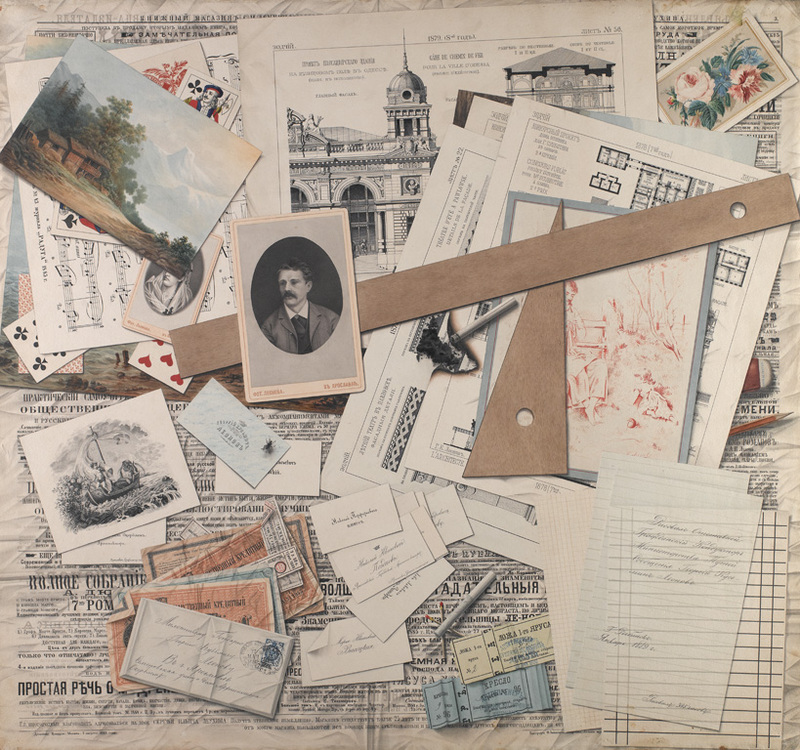 The touching subscription indicates the duration of the time he spent for the creation of this still-life: «I have been drawing this for 345 hours». Looking at the subjects on the artist's desk, we can understand that he had numerous hobbies and professional occupations. 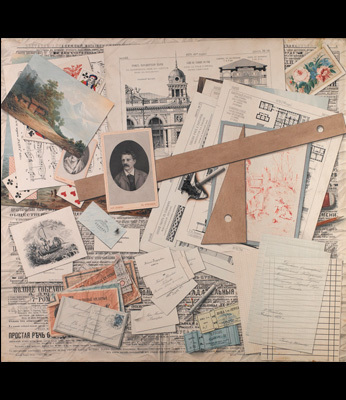 The newspapers, theatre tickets, architectural projects, music notes, drawings, letters, postcards, photographs, playing cards etc. are depicted very thoroughly... One can study this trompel'oeil infinitely long, finding new details telling more and more about the life of the provincial civil conductor. 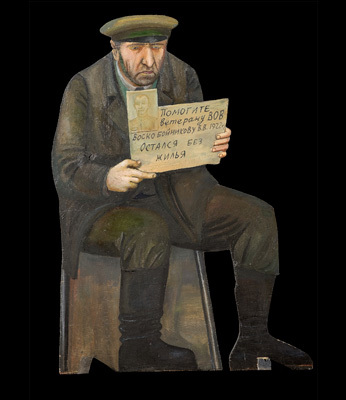 The trompel'oeil «A disabled veteran» belongs to the series "Underground passage" painted by Tatyana Grigorievna Nazarenko in 1996. The idea borrowed from the artists of the 18th century, appeared to conform entirely to the drastic social and cultural changes in the post-Soviet society. Thanks to the unusual theatrical form, the generalized images of ordinary people from the Moscow underground got symbolic sounding, and Nazarenko herself «made a passage» to the most actual direction in the modern art. Dmitry Petrovich Plavinsky is one of the best modern graphic artists. 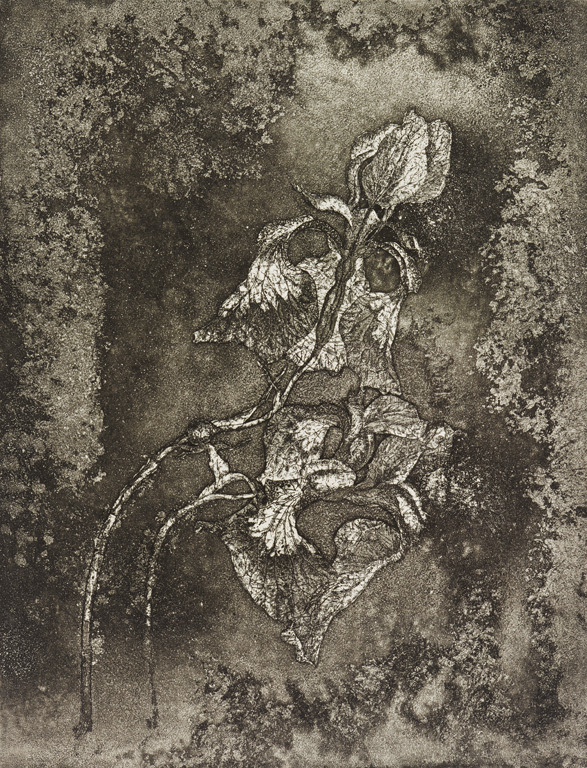 He works in a rare style for today - the etching technique which allows creating a complex light-and-shade texture of the compositions. Striving for an aesthetic and intellectual elitism in his art, Plavinsky resists to the official realistic tendency of the Soviet painting of 1960-1970s. The master defined his creative credo as the «structural symbolism». Any moment of human life or nature life is filled with philosophical or omen sense for the painter. The idea of growing irises can be apprehended as a symbolical updating and circulation of the eternal life. Count Feodor Petrovich Tolstoy was not only a remarkable painter, sculptor and medalist, but also a master of botanical drawing. 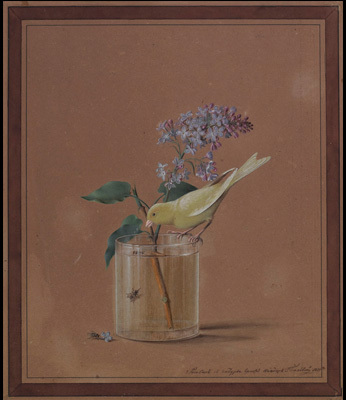 In the first half of the 19th century depicting single flowers in the pictures was very popular. From the one hand those pictures decorated the albums of the society beauties, but from the other hand they served as illustrations in botanical atlases. 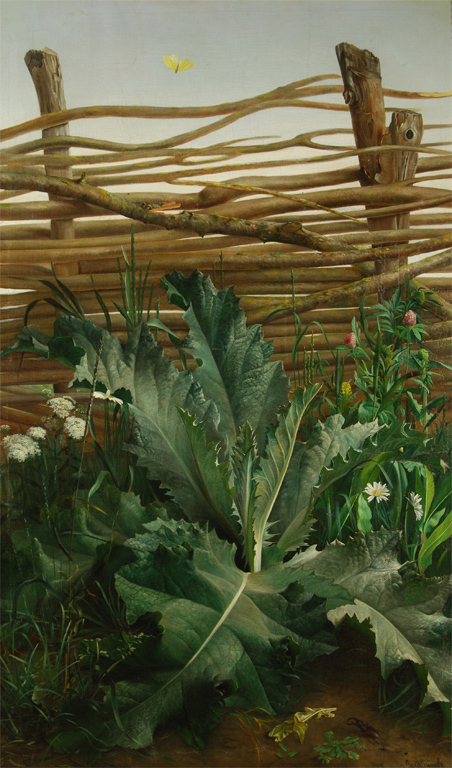 Tolstoy tries to show the structural peculiarities of the plants, to convey the slightest nuances of their colours «at most distinctness». However, the scientific authenticity was hardly the artist's aim. At time of Tolstoy, a parlor entertainment named «flower flirting» became very fashionable - each plant in the composition implied a certain feeling or a wish. In the language of this game purple lilac meant the first love. A magnificent still-life by Foma Gavrilovich Toropov looks like a greenhouse in which flowers and fruit blossoming and ripening at different times of the year are gathered together. Raspberries and a pumpkin, so usual for the climate of the central Russia, neighbour the southern fruit. A pile of fruit adjoins a bouquet of garden and wild flowers in a vase; a rare for that epoch flower celosia in a separate pot is also there. 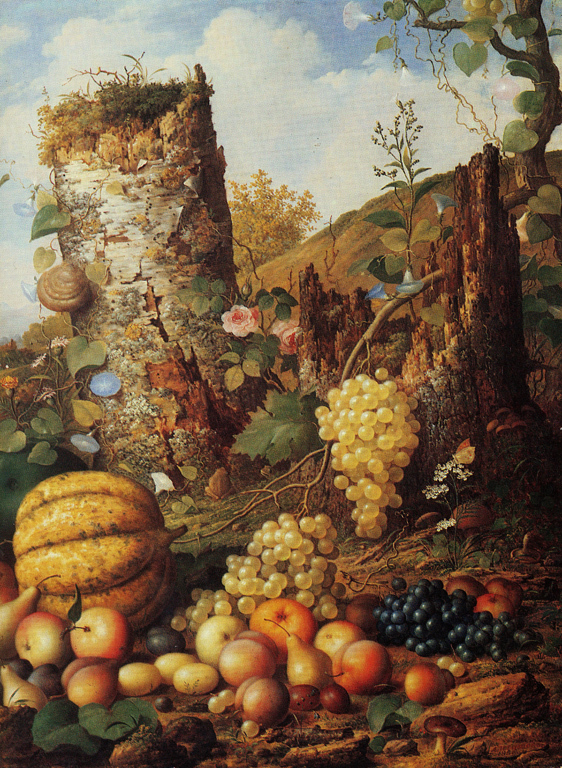 The picture is famous for the abundance and the combination of the saturated colors and their bright nuances. 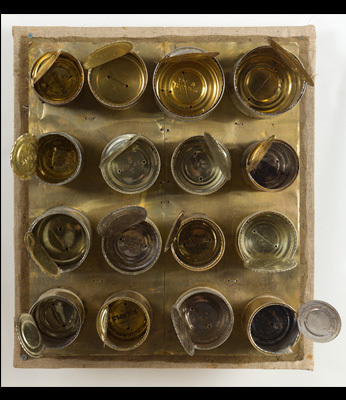 Boris Zakharovich Turetski is one of the first Russian creators of assemblages in which everyday subjects lose their direct household meaning and turn into objects of art. As a matter of fact, using the household litter, Turetski manages to preserve both aesthetic and sensual attitude to the material itself. In the picture, the empty cans of lustrous metal are not just overage or unnecessary things anymore. They are getting plastic and art value, confirming the words of Turetski: «Everything around is a plastic material for me, but I see plastics nowhere and consequently I notice it everywhere». Ivan Fomich Khrutsky is the only one representative of the still-life genre in Russian art of the first half of the 19th century, well-known to a wide range of art-lovers. 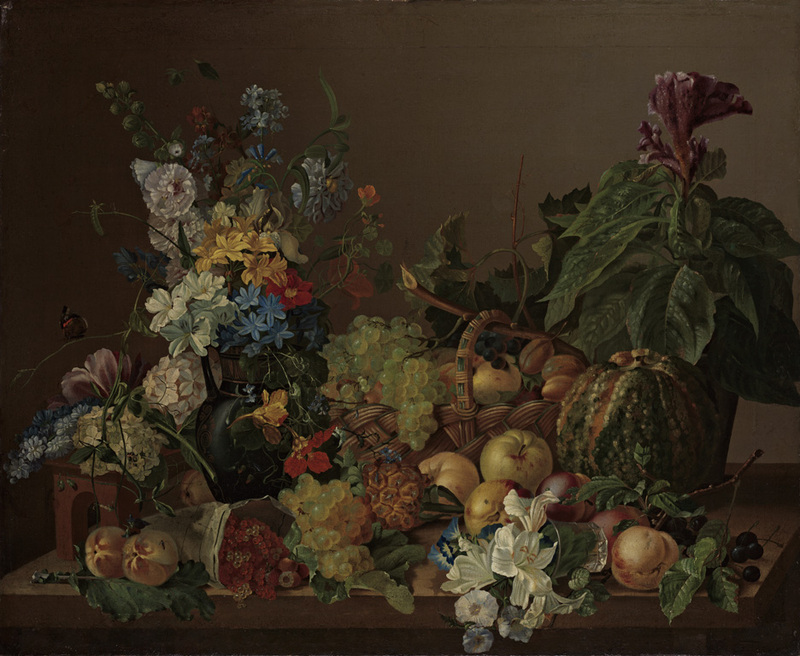 The canvas «Flowers and fruit» was created at the peak of his artistic career and reflected the classical representation of the main subject of the still-life painting. Combining fruits and berries, flowers and household items in the composition, Hrutsky built a regular pyramid of them with an accurately defined center point. The subjects in the foreground are thoroughly painted and brightly lighted, giving the feeling of their reality. Khrutsky's contemporaries appreciated these features of the pictures and willingly acquired his works to decorate their interiors. The picture by Evdokim Ignatievich Voloshinov in many respects reflects art signs of the beginning of the 20th century. 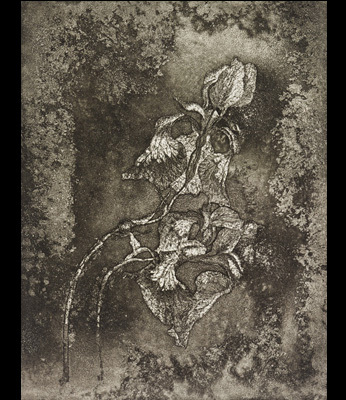 The artist obviously worked in the open air and strived to represent the life of the nature not deformed by the intervention of a man. 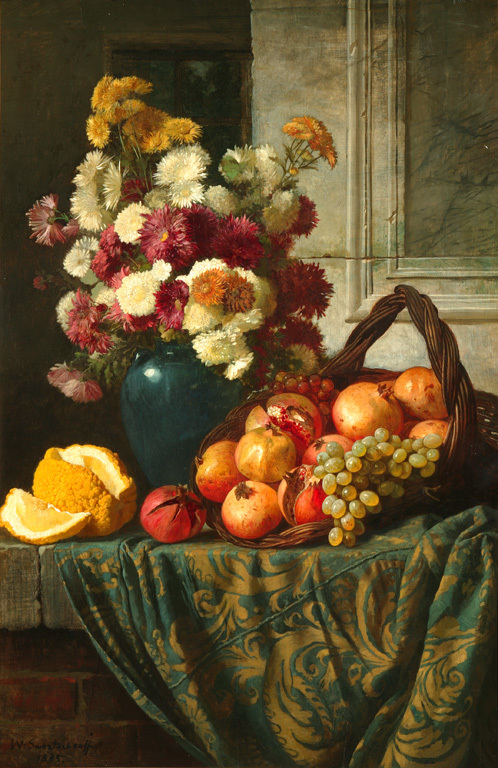 Overstepping the bounds of still-life painting, one of the main principles of which was creation of artificial scenery, Voloshinov uses the techniques, typical for this genre. He seems to be kneeling at the bottom of a wattle fence, depicting in detail not only each leaf and a blade of grass, but also the life of insects, usually hidden from the eyes of a man. 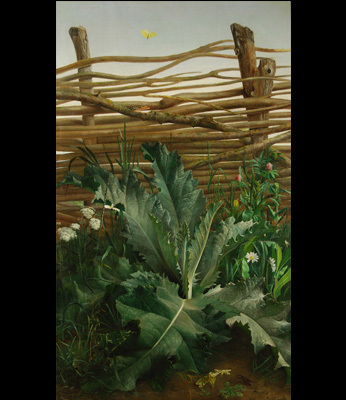 Under the leaves of a huge thistle the stag beetle slowly creeps, and the bright butterfly flits above the wattle fence. 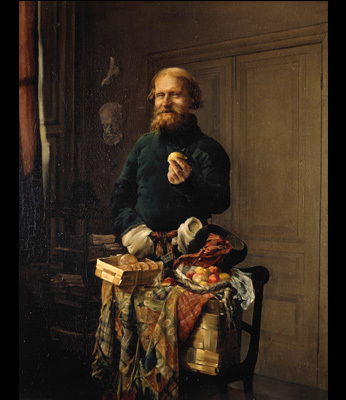 A street peddler of the 19th century in the picture by Valery Ivanovich Jacobi was also called «korobeinik» or «ofenya» at those times. 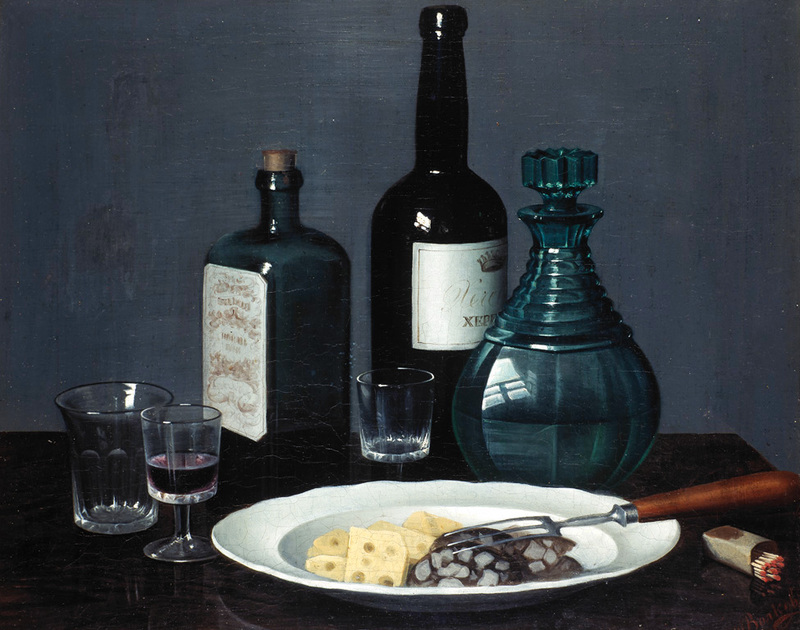 Still-life plays an important role in the creation of his image. The food in the bast-fiber boxes looks like a well thought-out still-life composition. 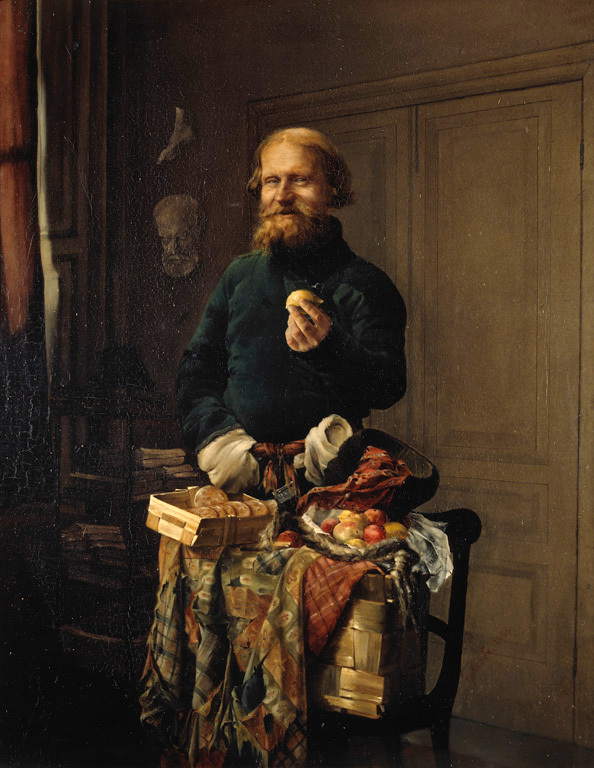 A lemon in the hands of the peddler also reminds of the classical traditions of the genre. The image of a cunning man offering his foodstuffs is very expressive in comparison with the traditional art-craft attributes in the painter's studio.